Synthetic peptide conjugated to KLH derived from within residues 1 - 100 of Human SKP2. Our Abpromise guarantee covers the use of ab19877 in the following tested applications. WB Use a concentration of 1 µg/ml. Detects a band of approximately 46 kDa (predicted molecular weight: 48 kDa). ab19877 detects a band at approximately 46 kDa that corresponds in size to that predicted for SKP2 (48 kDa). This band is detected in several tissue lysates. This antibody was tested in normal liver tissue lysates, but no band was detected. 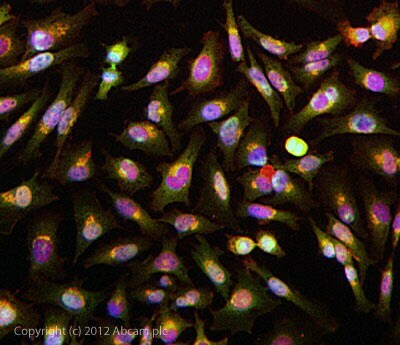 ICC/IF image of ab19877 stained HeLa cells. The cells were 4% formaldehyde fixed (10 min) and then incubated in 1%BSA / 10% normal goat serum / 0.3M glycine in 0.1% PBS-Tween for 1h to permeabilise the cells and block non-specific protein-protein interactions. 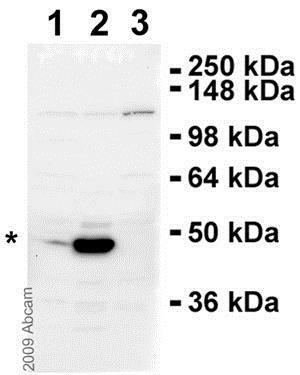 The cells were then incubated with the antibody ab19877 at 5µg/ml overnight at +4°C. The secondary antibody (green) was DyLight® 488 goat anti- rabbit (ab96899) IgG (H+L) used at a 1/250 dilution for 1h. Alexa Fluor® 594 WGA was used to label plasma membranes (red) at a 1/200 dilution for 1h. DAPI was used to stain the cell nuclei (blue) at a concentration of 1.43µM. Publishing research using ab19877? Please let us know so that we can cite the reference in this datasheet. we would like to test in WB the polycolonal ab19877. I am sorry this product did not perform as stated on the datasheet and for the inconvenience this has caused. As requested, I have issued a free of charge replacement for one vial of ab19877. Thank you for your email regarding the Skp2 antibody. I appologise if my last email was slightly strongly worded. I accept that changing blocking reagents and time etc can sometime effect the quality of westerns but in my experience these sorts of changes rarely improve a western that has no reactivity to one that is presentable. In this case I don't think it is going to be very fruitful spending a lot of time trouble shooting this western. Thank you for your offer of a refund for the antibody. As we are a charity funded lab every £200 pound for an antibody that does not produce result makes a big difference to us. I am not sure how the refund procedure works. I you need to send a credit note you may need to contact our departmental administrator, Mrs Dawn Wallace at email D.T.Wallace@bristol.ac.uk Thank you again for your help with this. Thank you for your reply. I have asked our accounts department to arrange this credit note to pay for the order. I hope this unfortunate matter will not deter you from purchasing at Abcam in the future. Please be assured that I will closely monitor the quality of this antibody following your complaint. Thank you very much for your reply and detailed protocol which is very similar to the one we recommend. In our experience too much blocking can prevent the antibody from binding adequately to the membrane unfortunately. I would therefore recommend to block the membrane for 1 hour only and as you have done in the past to incubate the primary antibody in TBST only. We also have very good results with 5% BSA in the same conditions. If you still have problems with a reduced blocking time please let me know by e-mail or do not hesitate to call me and I will arrange a refund on your order immediately.